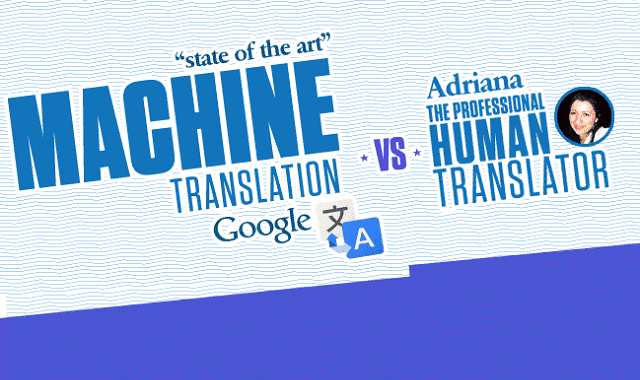 Person vs. Google Translate #infographic ~ Visualistan '+g+"
Translation services have changed rather drastically in the last several years. Until recently, if someone wanted a translation, they needed to either learn the language themselves, look up the meaning word for word, or have someone on hand who could translate the information. Nowadays, there are many services that instantly offers translation, including Google. Google does have helpful applications where a user can take a picture of a foreign street sign or menu and have the application instantly show what it says in English (or another language). However, for longer text, such as in paragraph form, Google offers Google Translate online. For someone who is considering a translation service, they need to determine whether a person or an online option like Google Translate is going to work for them. Google Translate and other online services offer a literal translation of everything word for word. Now, this can have some disadvantages for sentence structure and longer context. It does offer a nice, quick understanding of the text, but it offers poor sentence structure and often times the sentences are going to be poorly worded or even not make complete sense. This is because Spanish to English, or really any other language conversion, there are going to be some words that are placed in front or behind verbs, nouns and other key words. The service is offered for a quick understanding, but not a comprehensive, business appropriate product. As long as the individual is fluent in both English and Spanish, they should have no problem converting the text into an easy to read, fluent and well forming sentence that is going to not only allow anyone to understand what the information is, but it is perfect for a business translation where grammar is key. Beyond this, it can also help if there is an audio recording that is being translated. As is the case with text, a person can understand the meaning and then convert it perfectly into the English from spoken Spanish. Should Google Translate hear a word due to an accent that is not recognizable, it is not going to offer a translation for this word, which in turn can cause problems for the complete understanding. When it all comes down to it, it really just depends on what someone needs a translation for. If they are traveling, need a quick understanding of some information and just want it for their personal use, Google Translate and similar is fine. However, for professional quality, always go with the person.